Here at Active Ink we are trying to give you our personal evaluations of a number of Tablet PC devices that can serve as useful platforms for running our software. Obviously, our focus is narrow and if you want a broader overview of these devices we want to point you to a blog that does a much more thorough job of scrutinizing tablet hardware than we do. Visit http://www.robbushway.com and check out what rob has to say. We couldn't find ourselves disagreeing with any of his opinions and you probably won't either. Those of you who follow our company closely will be wondering why we are reviewing an Android OS device when Active Ink is strictly a Windows OS company. The answer is two-fold: 1) we are constantly barraged with customer inquiries about Android/Ipad tablets, and 2) we are currently testing a web-based version of Active Ink forms that can be accessed by any device with an internet connection. In theory, these web-forms could be filled out by any Ipad or Android; but it turns out that your ability to fill them out is constrained by the type of device you are using. If your device has no pen and has no ability to recognize handwriting, you can only interact with a small subset of the e-form features that you can access on a traditional tablet PC with an active digitizing pen. Since the Ipad and the Android tablets do not offer handwriting recognition and most do not offer styluses, they fall into the “limited subset” category. You can use their virtual keyboards to fill out type-in fields, operate menu pull downs, and select check boxes, but you cannot write notes on top of images and you can’t sign your name to an e-form. This is because the Ipad and Android’s touchscreens interpret fingertip or stylus wiggles as an attempt to scroll the image, NOT as a writing input. Even with those limitations in mind, we decided to test the HTC Flyer ($499) because it is one of the few Android tablets that comes with its own digital pen (a $79 extra) and software to support it. We wanted to see if this device and its pen could be put to an Active Ink use. It turns out that it can’t. While we liked the Flyer and its pen, this is not a device that can be used to complete an e-form containing any complexity -- meaning with signature fields and note fields. This is because the Flyer’s stylus (called a “Scribe”) is NOT a true digital pen or stylus in the traditional sense. It is a unique input device designed to be used with only a few pre-arranged drawing functions with in the Flyer's OS. It cannot be used as a pointer or key operator and it can only write on special pages (such as with the Flyer’s book reader) or on jpg screenshots that the Flyer can save and share. While we can see a myriad of cool uses for these annotatable snapshots, they don’t jive with Active Ink. Most importantly, you can’t convert the Flyer’s handwritten scribblings into text in any program, they can merely be saved as flat images. As a result you can’t sign your name to web-based form using the Flyer, with or without its pen, unless you take a flat "screenshot" of that form after you have typed in most of the fields, saving the signature field for last. Doing this creates a flat, lower-resolution copy of the form, which could be emailed or archived, but none of the inputted data could be extracted. That said, there are a few positive things that we can point out in this little Flyer. While its screen size is smaller than the HP Slate 500 that we recently reviewed, its workable area, resolution and precision of input all feel less frustrating than that Windows machine. However, this impression is probably due to the fact that the ease of scrolling, page turning, and zooming are all superior to that found a traditional Windows machine, which requires you to locate down a tiny scroll bar, grab it, and slide it with your fingertip or pen. One of the frustrating points with the Flyer if you are a traditional tablet PC user is the temptation to try to use its pen as an active digitizing pen -- it looks like a traditional two button A.D. stylus so you will find yourself point and clicking your way through pages as if it were a traditional stylus. All this does is create screenshot images of whatever you touch, causing to start over and put the pen down. Bottom line: Can you use the Flyer (or any other Android tablet) to fill out a web-form? Yes you can – as long as the form requires only typing, menu pull-downs, and check-box selecting. You cannot draw on or annotate the simple forms these devices can handle, you cannot sign with them, and you certainly cannot convert handwriting with them. These limitations remind us of the world of baseball. If the traditional Windows tablet PC were a baseball player, it would be a versatile triple threat that could hit, field, and pitch successfully. Using Active Ink software these traditional tablets can convert ink to text, provide precise pen input resulting in elegant handwriting, and they can draw on documents or produce real signatures. In contrast, Android tablets are lumbering designated hitters. They can’t “pitch” or “field” at all, but they’re pretty good at going to the plate with their one specialty. Android tablets can’t use Active Ink software and they can only “see” certain dumbed-down web-based forms, but they scroll well and typing on their virtual keyboards is easier than using a Windows tablet virtual keyboard. If a company had no need for handwriting input, ink-to-text conversion, free-form annotation, or signatures; it could deploy a fleet of Android smartphones to fill out its greatly simplified forms and get by. The question is, will the marketplace demand more designated hitters or more triple-threat utility ballplayers? Time will tell. It seems that small, sub-$1000 slate computers are popping up like mushrooms these days and in order to alleviate some of the confusion among our clientele, Active Ink will assess some of these devices as platforms for filling out electronic forms. We realize that this one criterion is not a fair gauge of a machine’s overall capabilities, but it’s the only aspect we’re interested in and if you’re reading this, chances are it’s the only thing you’ll be interested in too. 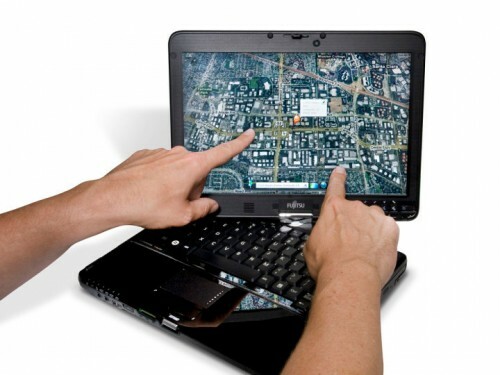 For most of our customers, the tablet pc is a one-purpose device. They use it in business to input data into electronic forms as fast as they can. Therefore the speed and ease of input are their paramount concerns because by saving time and eliminating redundancies, they save money. Anything that interferes with the speed or ease of data input is a negative that can fatally detract from the desirability of a platform in spite of its many other attractive qualities. With these thoughts in mind, we examined HP’s new Slate 500, one of the first sub-$1000 Windows tablets to hit the market. We had high hopes for this device thanks to HP’s promotional videos which showed that it was fully capable of accepting pen input and functioning in a business environment. When combined with HP’s solid reputation, the device’s a small form factor and its initial $799 release price, we thought this Slate would be a killer. Then we opened the box. Sadly, our real world experience with the Slate was decidedly less impressive. And in the ultimate test of desirability –- namely, which worker in the office wants to take this sucker home and keep it -– the HP Slate 500 faired poorly. None of us were very impressed with the gadget and today it sits in a drawer; unloved, unwanted, and destined to be unloaded on ebay when we get around to it. Our blasé overall impression was due to the Slate’s ergonomics rather than its technical specifications. Since the HP Slate 500 is a Windows 7 tablet, it is fully compatible with Active Ink and our e-forms can be filled out on it without resorting to any work-arounds. This is a major plus. Furthermore, there is nothing really wrong with the HP Slate’s performance or its combination of ports, cameras, display size, memory, or chips. It’s just a difficult little device to hold in your hands and fill out forms with its digital pen. First there is the Slate’s plethora of awkwardly-placed external buttons (volume, control/alt/delete/home, keyboard, & power) which are all found along the sides of the device towards the corners – in exactly the same spots where your fingers tend to hold the device! In our experience, inadvertent pressings of these buttons were numerous and frustrating. If you try to move your fingers to avoid them, you have to hold the device in an awkward position. We also took some small issue with the screen, which seems smaller than its 8.9” size. It is smaller than the Ipad, but larger than the HTC flyer that we’ve also reviewed in this blog. If you pull up the virtual keyboard or the Microsoft Handwriting input panel at normal size, you can see little of the form behind them, necessitating nearly constant scrolling and scrolling on a small-screened Windows device is quite a bit more frustrating than scrolling on an Android or Ipad with their flick-and-expand sensitivities. For example, examine the following comparison photo. Finally, the most frustrating aspect of the HP Slate 500 is its pen. 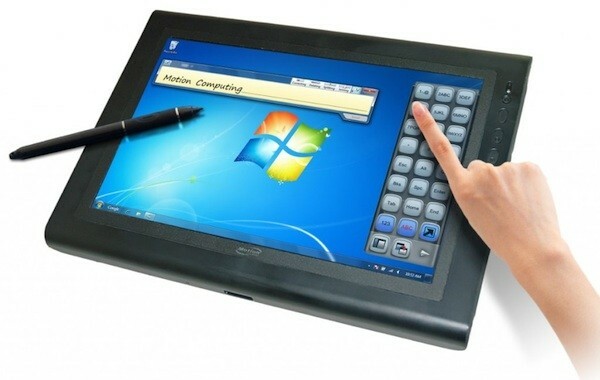 The Slate is a touchscreen device, so it is essentially a dual digitizing tablet, but it uses a unique hybrid stylus that has a spongy tip, which compresses slightly when touching the screen, probably to trigger activation of its electronic features powered via an internal battery. This means that even though the Slate has a touchscreen, its stylus can control the cursor position by floating its tip just above the screen. However, when the stylus was touched to the screen it was frequently hard to tell if the spongy tip had successfully engaged or not. We have never encountered this type of hybrid stylus before and we found its responsiveness to be sporadic and imprecise, causing us to make frequent errors. Since every error necessitates a repeated attempt to input a data string or to activate a screen function when used as a pointer, this imprecision slows things down and increases the user's frustration factor. Handwriting with the Slate's stylus was challenging, with a noticeable lag, frequent omissions at the start of words or sentences, and that irritating spongy feel. We quickly found ourselves yearning for a “dumb” touch stylus or an "old school" active digitizer with more reliable responsiveness. Sometimes a hybrid fish & fowl can neither fly nor swim and this seems to be the case with the Slate 500's stylus. Bottom Line: While the Slate 500 is a true Windows 7 tablet and it can use Active Ink software right out of the box, no one in our office wanted to adopt it as their tablet of choice. The frustration factor of the Slate’s awkwardly-placed buttons, its imprecise pen, and its crowded screen made us dread filling out forms on it. It may carry a low $799 price, but we found ourselves wanting to either pay more for different machine or pay less for a used "old school" device that is one or two generations old. HP has provided tablet PCs (TouchSmart tm2) to the contestants on the TV show Project Runway according to Xavier Lanier at GottaBeMobile. The contestants use them in the designing of their sketches. I don’t watch the show, but I think sketching is a great way to utilize a tablet. The pen is a much more precise instrument for drawing than using your finger. Click on promo demo below to get an idea of how they are using the tablets. Mary-Jo Foley reports that Microsoft CEO Steve Ballmer told the 14,000 partners during his July 12 keynote at the Worldwide Partner Conference to expect new Windows 7 slates before the end of this year. Microsoft and its existing PC partners, including Asus, Dell, Samsung, Toshiba and Sony, will all be fielding Windows 7 slates in the coming months, Ballmer said. These slates will be available at a variety of price points and in a variety of form factors — with keyboards, touch only, dockable, able to handle digital ink, etc. Sirina Fire Protection Corp. is one of the New York’s metropolitan area’s largest fire protection contractors. Some of their customers include the New York Yankees, American Express and the JFK Airport. Sirina Fire Protection Corp. uses Active Ink Software with a tablet PC to manage their service calls. Their technicians fill out service tickets onsite and email them back to the main office. The tickets then get processed faster and invoices are generated sooner. GottaBeMobile posted a link on their site to a new tablet, the model TH700. It appears to be a relatively inexpensive tablet listed at $1149 or $1099 with a $50 rebate on Fujitsu's Online Store. Motion Computing®, a leading provider of integrated mobile computing solutions, today announced the J3500 tablet PC. This is a rugged tablet and replaces for the previous model, the J3400. Built on the Motion® J-Series line of tablet PCs, the J3500 features Intel® Core™ vPro™ processors for enhanced performance, security and manageability. The J3500 offers a variety of integrated features including touch technology, Gorilla™ glass, and expanded storage options. You have your choice of the Core i5 or Core i7 processor, a 160GB hard drive or 128GB SSD, a 3-megapixel camera and Windows 7 Professional operating system. The price for the j3500 is $2,299. To review the complete press release, click Here to go to Motion Computing’s web site. There is also a video demo prepared by GottaBeMobile that highlights some of the new features.